With Valentine's Day right around the corner, we sure do have something for you, love bugs, especially if you can never enough of strawberries! It all started with some burnt sugar vanilla ice cream that wasn't being eaten hanging out in the freezer. We all have that random ice cream that's been forgotten (or maybe not, but let's pretend you do for the sake of this recipe because ice cream is always a good idea) and some milk in the fridge. That's an insta-dessert right there, but if you're celebrating love and friendship, then you need to level up your kitchen blender skills. 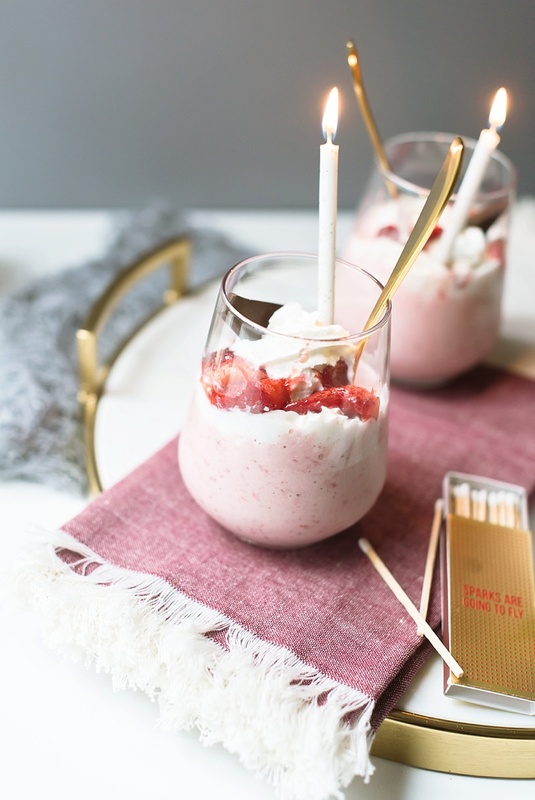 Next up in Sips & Bites, a food and drink series that is focused on beautifully and deliciously inspiring treats for wedding and home celebrations, we're sharing a quick and majorly yummy way to bring together warm fuzzy feelings with sweet cravings. 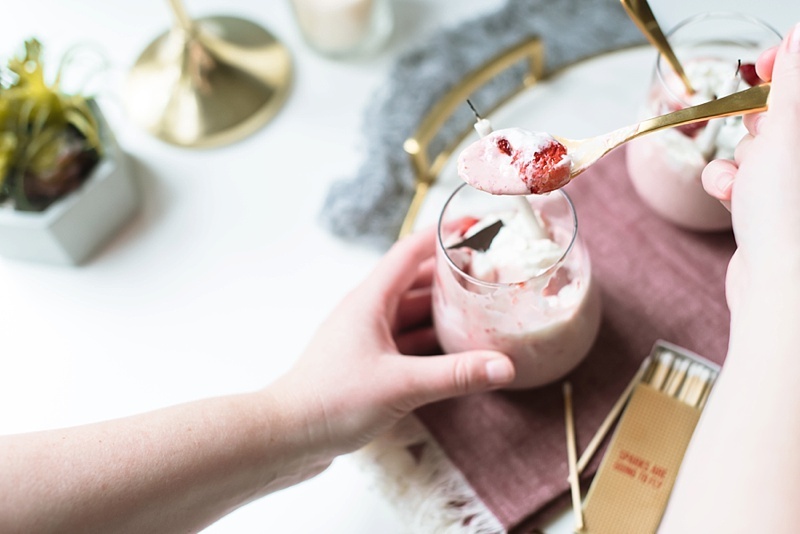 Inspired by love's spark and ingredients typically already found in your kitchen, these gourmet milkshakes are a decadently easy treat to make and are the perfect touch to a Valentine's date night-in with your sweetie or your pals. 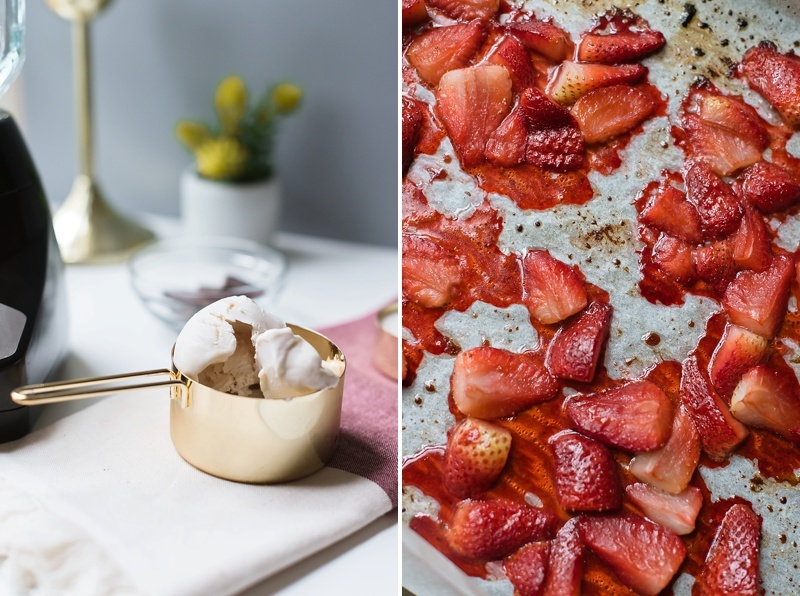 Grab some strawberries and preheat that oven because you won't want strawberries any other way after trying this recipe! 1. 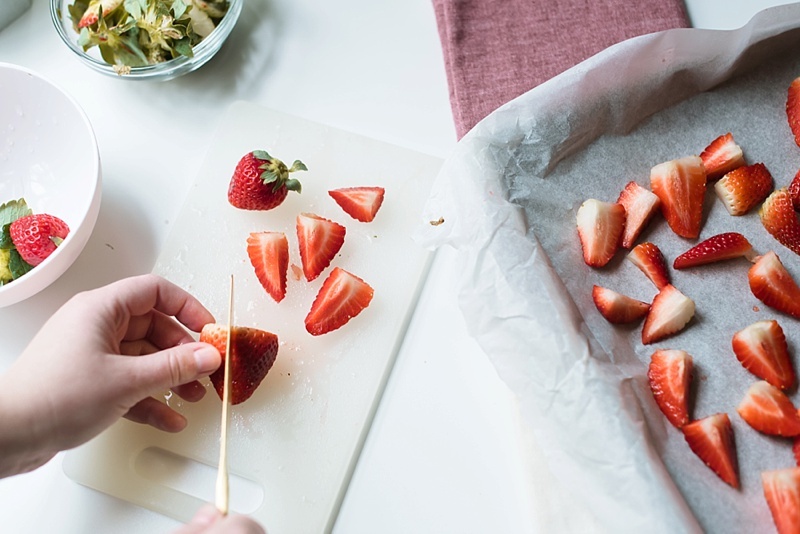 Preheat the oven to 400 degrees F and then wash, remove strawberry tops, and quarter cut strawberries. 2. Place a piece of parchment paper on a baking sheet. 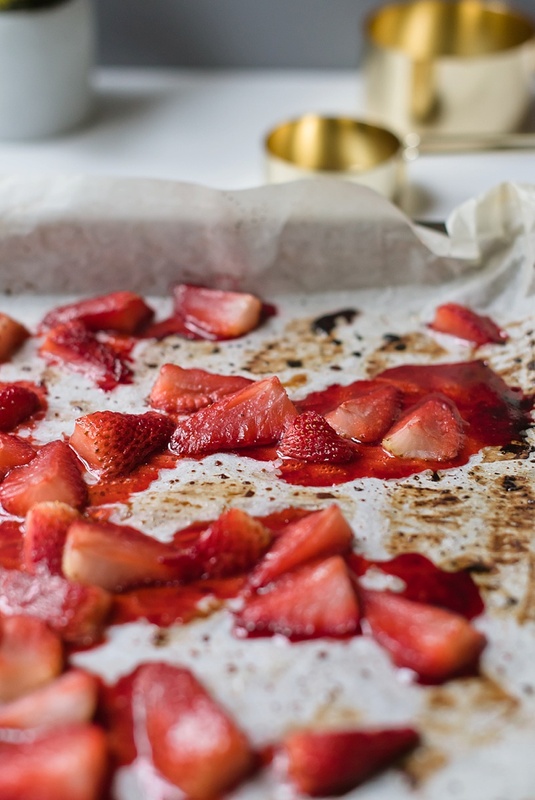 Evenly spread out strawberries on the parchment to allow for even cooking. 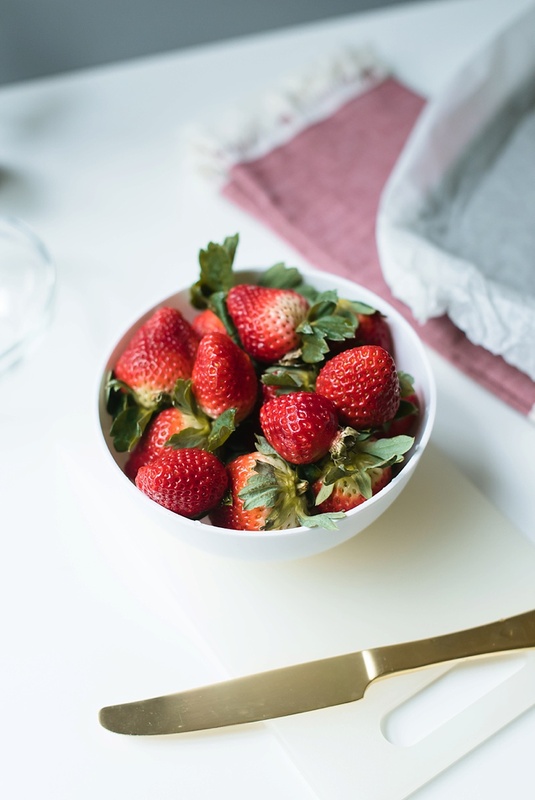 Drizzle and sprinkle strawberries with sugar, salt, oil, and vanilla extract. Want an extra kick to your date night in milkshake? Consider adding splashes of your choice of vanilla vodka. 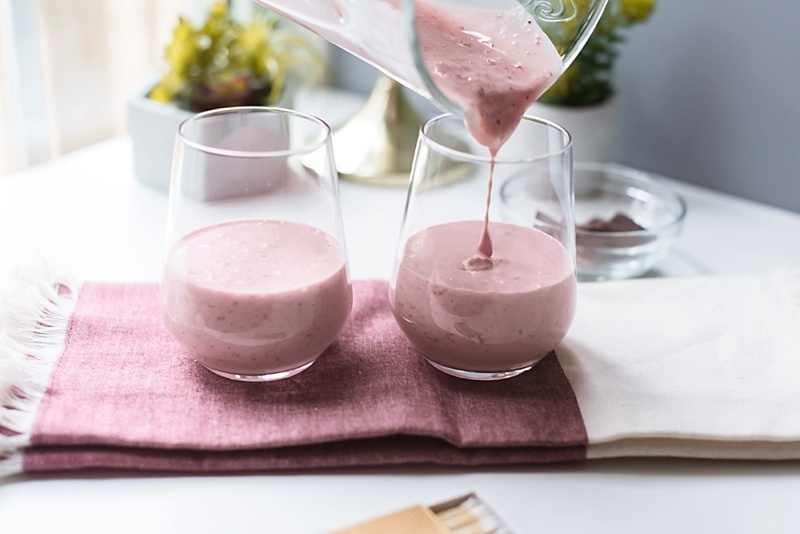 This recipe is technically vegan (dairy-free with nut-based products), but for those who have allergies to nuts, you can substitute ingredients for regular cow's milk and ice cream, of course! Make the necessary substitutes for your restrictions as they won't affect the final dessert. 4. 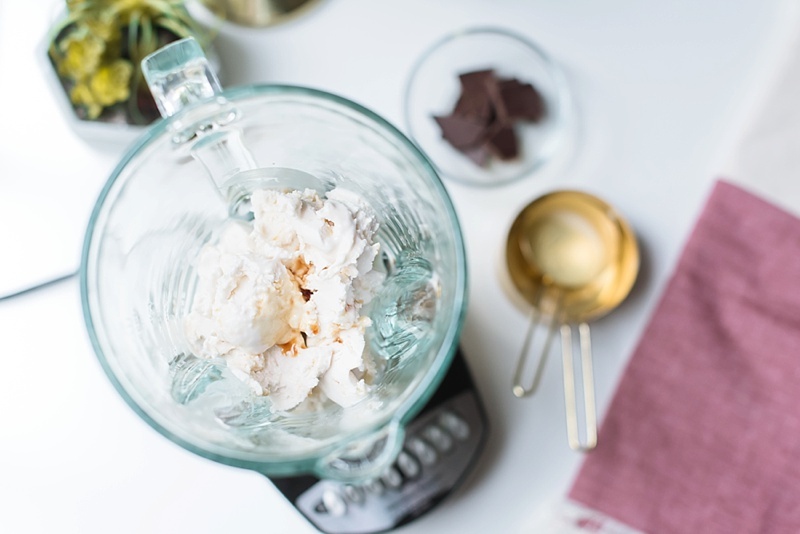 To create the actual milkshakes, use a blender to blend the ice cream, milk, and vanilla extract together. 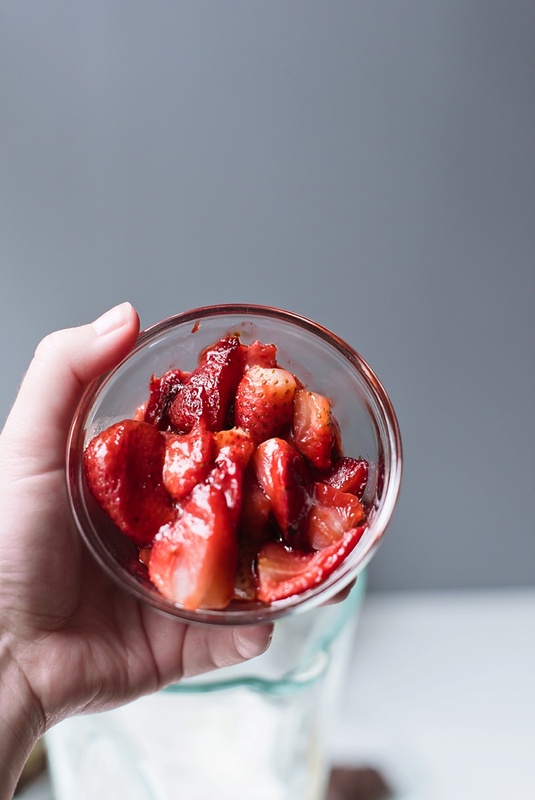 Add in half of your roasted strawberries (but reserve the other half to decorate and layer) and lightly blend or stir in depending on your preference. 5. 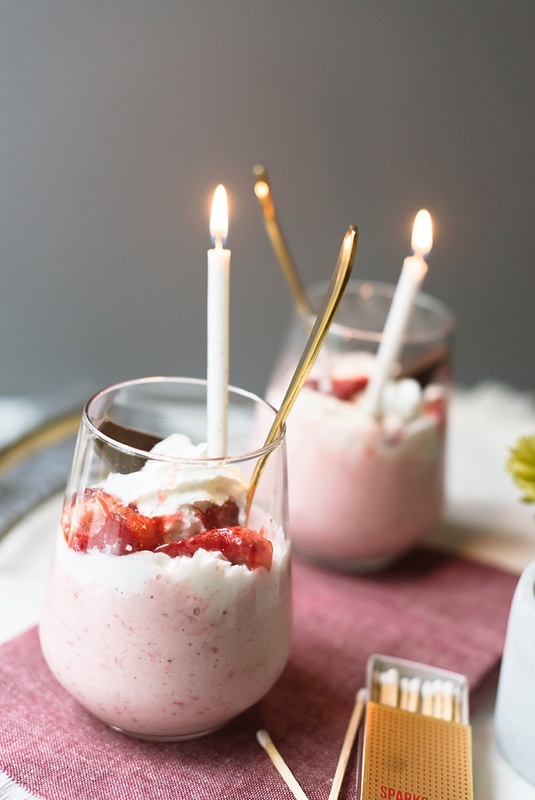 Layer your milkshakes with whipped cream, reserved roasted strawberries, and decorate with your favorite toppings. 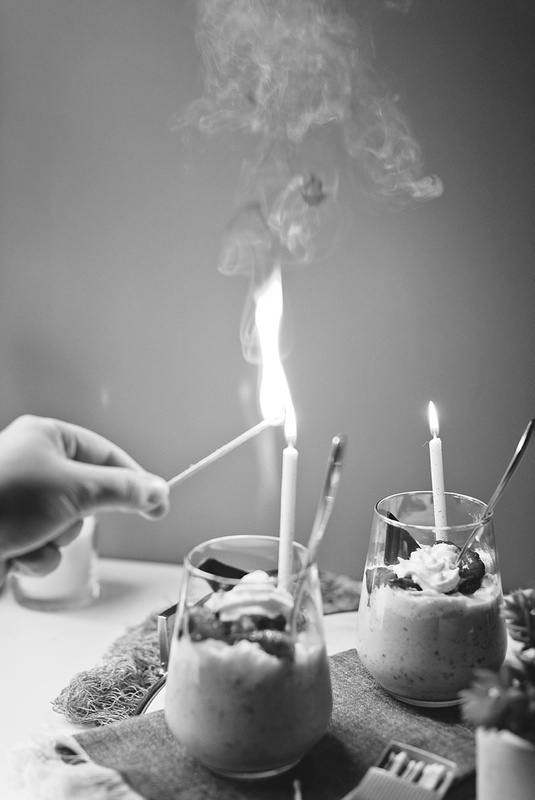 For the ultimate spark, place a glittery white birthday candle in it and serve to your sweetie. Grab a blanket, get cozy on the couch, and enjoy! • Indoor Camping: Channel your childhood forts and set up your tent in your living room! Grab your sleeping bags or blankets, turn on that fireplace, and make an outdoor-inspired dinner for two. • Wine and Cheese Tasting: If you and your partner are foodies, gather up different wines and cheeses from your local market. Include some of your favorites and some new sips and bites you've never tried before. For next level tasting, blindfold each other and take turns guessing which wine or cheese is which. Do what the connoisseurs do and scribble down descriptions of the flavors and scents you have experienced. • Homemade Retro Drive-In: Set up your Apple TV or a projector for the ultimate movie night. Make your milkshakes, some flavored popcorn and drinks, and put on your favorite movies. Bonus points for bistro string lights and late night snacks of nachos! • DIY Paint Studio: Find your inner Monet by setting up some art easels, blank canvases, paints, and a photo of you together. Get ready for some sentimental smiles and laughs as you discover your artistic interpretations of you as a couple. • Spa Night: Because real life, sometimes couples are just exhausted. Turn that fatigue into a relaxing evening together with low lighting, relaxing music, and soothing scents. Whether you love long hot baths, essential oils, or foot massages, take turns enjoying your favorite zen moments. 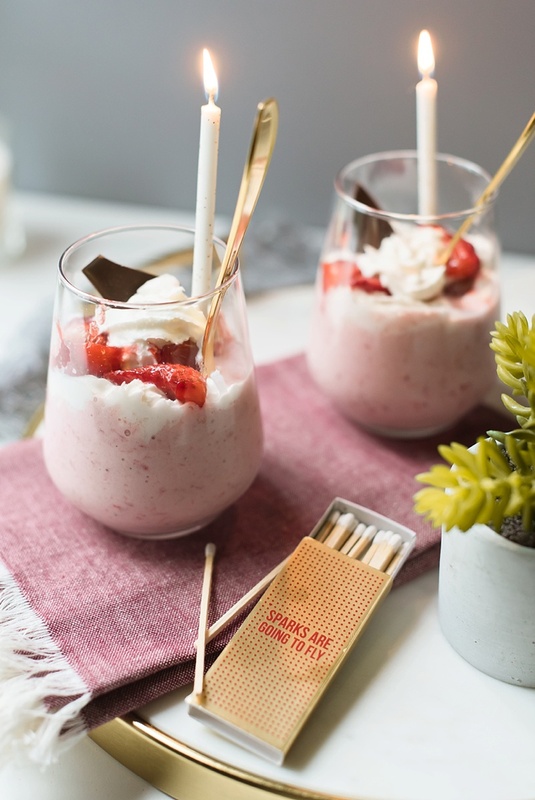 Sips & Bites is Tidewater and Tulle's food and drink series that is focused on beautifully and deliciously inspiring treats for wedding and home celebrations.